International Journal of Applied Science-Research and Review is an open access electronic journal aiming to provide an online compendium that covers all aspects in diverse areas of Applied Science including Applied Microbiology, Applied Psychology, Agricultural Engineering, Applied Aviation Sciences, Applied Ecology, Applied Nutrition, Applied Chemistry, Biology, Biotechnology, Bioengineering, Business and Economics, Chemistry, Computer Science, Chemical Engineering, Environmental Science, Engineering, Finance, Food Science, Geology, Healthcare System, Linguistics, Mathematics and Statistics, Medicine and Architecture, Materials Science, Nanotechnology, Nanoscience, Natural and Technological Sciences, Physics, Social Sciences, and related disciplines. 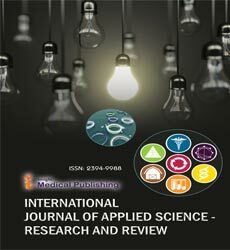 International Journal of Applied Science-Research and Review provides open access to peer reviewed research as part of its commitment to readers and authors. We make all International Journal of Applied Science-Research and Review research articles freely available online and send them directly to for archiving and indexing. It is a study related to accumulation of information and application of various scientific forms and knowledge of different aspects are transferred and applied in the physical environment. It is done and to increase the knowledge and to make more practical applications like inventions and technology. The applied science is a vast area which is the integration and sumtotal of many departments which includes agronomy, animal husbandry, agriculture, Mariculture, food science, food technology, medicine, bioengineering, Nanoscience, biotechnology, electrical technology etc. International Journal of Basic and Applied Sciences, International Journal of Applied Science - Research and Review, International Journal of Current Microbiology and Applied Sciences, American Journal of Applied Sciences, International Journal of Applied Science and Engineering Research, Egyptian Journal of Basic and Applied Sciences, International Journal of Applied Science and Technology, Modern Applied Science, International Journal of Current Medical And Applied Sciences, International Journal of Applied Management Science. Applied microbiology is a scientific discipline that deals with the application of microorganisms and the knowledge about them. Applications include biotechnology, agriculture, medicine, food microbiology and bioremediation. Applied microbiology is the study of the microbial world and the way it interacts with our own. It looks at how we can harness and utilize the powers of the microbes in areas ranging from biotechnology to pest control, to bio-refineries, to pharmaceutical applications. Journal of Applied Microbiology, Applied Microbiology: open access, Applied Microbiology and Biotechnology, International Journal of Current Microbiology and Applied Sciences, Systematic and Applied Microbiology, International Journal of Applied Microbiology and Biotechnology Research, Journal of Pure and Applied Microbiology, Journal of General and Applied Microbiology, Journal of Applied & Environmental Microbiology, Microbiology Journal, International Journal of Microbiology and Biotechnology. Bioengineering or Biological engineering is the application of the life sciences, physical sciences, mathematics and engineering principles to define and solve problems in biology, medicine, health care and other fields. Bioengineering is a relatively new discipline that combines many aspects of traditional engineering fields such as chemical, electrical and mechanical engineering. Examples of bioengineering include: Artificial hips, knees and other joints Ultrasound, MRI and other medical imaging techniques Using engineered organisms for chemical and pharmaceutical manufacturing. Bioengineering graduates are employed by a variety of institutions, including medical device manufacturers, pharmaceutical companies, regulatory agencies and medical research institutions. Bioengineering graduates are prepared for continued study to pursue careers in medicine, law, business and other fields. International Journal of Biomedical Engineering and Technology, Journal of Bioengineering & Biomedical Science, Journal of Biomedical Engineering, Journal of Bioscience and Bioengineering, Journal of Biological Engineering, BioMedical Engineering OnLine, Journal of Medical and Biological Engineering, American Journal of Biomedical Engineering, Journal of Biomimetics, Biomaterials and Biomedical Engineering, Journal of Biomedical Sciences, Bioengineering-Open Access Journal. Applied psychology is the study of people- how they think, how they act, react and interact. This subject is concerned with all aspects of behaviour and the thoughts, feelings and motivations underlying such behaviour. Applied psychology is the use of psychological methods and findings of scientific psychology to solve practical problems of human and animal behavior and experience. Some of the areas of applied psychology include clinical psychology, counseling psychology, evolutionary psychology, industrial and organizational psychology, legal psychology, neuropsychology, occupational health psychology, human factors, forensic psychology, engineering psychology, school psychology, sports psychology, traffic psychology, community psychology, medical psychology. Journal of Applied Psychology, Journal of the Indian Academy of Applied Psychology, Applied Psychology Journal, American Journal of Applied Psychology, Journal of Applied Developmental Psychology, International Journal of Applied Psychology, International Journal of School and Cognitive Psychology, Applied Psychology in Criminal Justice, Journal of Applied Sport Psychology, Applied Psychology: An International Review. Nanoscience is an emerging area of science which involves the study of materials on an ultra-small scale and the novel properties that these materials demonstrate. Nanoscience is cross disciplinary, meaning scientists from a range of fields including chemistry, physics, biology, medicine, computing, materials science and engineering are studying it and using it to better understand our world. Nanoscience has the potential to reshape the world around us. It could lead to revolutionary breakthroughs in fields ranging from manufacturing to health care. Nanotechnology, International Journal of Applied Science - Research and Review, Science and Applications Journal, Nanomedicine: Nanotechnology, Biology, and Medicine Journal, International journal of nanomedicine, Journal of Nanobiotechnology, Journal of Nanoscience and Nanotechnology, Journal of Nanoparticle Research, International Journal of Biomedical Nanoscience and Nanotechnology, Journal of Nanomedicine & Nanotechnology, Journal of Nanomaterials & Molecular Nanotechnology, Advances in Natural Sciences: Nanoscience and Nanotechnology, American Journal of Nanomaterials, Applied Nanoscience. Aviation science refers to aircraft operations and support systems. It also includes flight operations, it includes aircraft maintenance, air traffic control, airport and airline management. Aviation Science will offer aviation professionals such as flight crewmembers, air traffic controllers, flight dispatchers, maintenance technicians, and airport and airline management personnel the opportunity to significantly enhance their knowledge of the aviation community and aerospace industry. International Journal of Applied Aviation Studies, International Journal of Applied Science - Research and Review, International Journal of Aviation Management, International Journal of Aviation Systems, Operations and Training, Journal of Aeronautical Sciences, Aerospace Science and Technology, International Journal of Aviation Psychology, Journal of Applied Sciences and Arts. What do you think would happen if all of the trees in the rainforest were cut down, or if chemicals were spilled in a river, or if snow and rain fall increased drastically. So, at this current time, the world around us is changing at a very rapid pace. Some changes are beneficial, but many of the changes are causing damage to our planet. The field of environmental science is a valuable resource for learning more about these changes and how they affect the world we live in. Environmental science is the field of science that studies the interactions of the physical, chemical, and biological components of the environment and also the relationships and effects of these components with the organisms in the environment. It has been divided into three main goals, which are to learn how the natural world works, to understand how we as humans interact with the environment, and also to determine how we affect the environment. Journal of Environmental Sciences, Journal of Environmental & Analytical Toxicology, International Journal of Environmental Science and Technology, International Journal of Environmental Sciences, International Journal of Environment and Pollution, Environmental Science: An Indian Journal, International Journal of Environmental Science and Development, American Journal of Environmental Sciences, International Journal of Environmental and Science Education, Journal of Environmental Protection. Biotechnology is the most exciting and revolutionary science of this century. It is a field of applied biology that involves the use of living organisms and bioprocesses in engineering, technology, medicine and other fields requiring bioproducts. Biotechnology has applications in four major industrial areas including : Health care, Crop production and agriculture, Non food (industrial) uses of crops and other products (e.g. biodegradable plastics, vegetable oil, biofuels etc.) and Environmental uses. Journal of Biotechnology, International Journal of Applied Science - Research and Review, Journal of Biotechnology & Biomaterials, International Journal of Biotechnology, Journal of Applied Biology & Biotechnology, International Journal of Biotechnology & Biochemistry, International Journal of Biotechnology and Molecular Biology Research, Journal of Biotech Research, Indian Journal of Biotechnology, Journal of Microbiology and Biotechnology, Journal of Animal Science and Biotechnology. It is also called Ecological or Environmental technology. Applied ecology is a subfield within ecology, which consider the application of the science of ecology to real-world (usually management) questions. It is an integrated treatment of the ecological, social, and biotechnological aspects of natural resource conservation and management. Multiple apects of applied ecology include: Agro-ecosystem management, Biodiversity conservation, Biotechnology, Conservation biology, Ecosystem restoration, Habitat management, Invasive species management, Protected areas management, Rangeland management, Restoration ecology. Journal of Applied Ecology, Basic and Applied Ecology, Ecology Journals, Applied Ecology and Environmental Sciences, West African Journal of Applied Ecology, Iranian Journal of Applied Ecology, Applied Ecology and Environmental Management, Applied Ecology and Natural Resource Management, Functional Ecology. As we know that the food that we eat is digested and absorbed and it is utilized by our body. Food helps us in staying healthy as it provides nutrition. Our diet should be such that it meets our nutritional requirements and thus helps to be sound health. Applied Nutrition is the branch of the Food and Drug Administration (FDA) that regulates food, dietary supplements, and cosmetics. Nutrition is the science that expounds the interaction of nutrients and other substances in food. In relation to have a healthy life as by maintenance, growth, reproduction, health and disease of an organism. It includes food intake, chewing, absorption, assimilation, biosynthesis, catabolism and excretion. Journal of Applied Animal Nutrition, International Journal of Applied Science - Research and Review, The International Journal of Applied and Basic Nutritional Sciences, American Journal of Clinical Nutrition, Journal of Clinical Nutrition & Dietetics, Journal of Nutrition & Food Sciences, International Journal of Food Science, Nutrition and Dietetics, The Journal of applied nutrition, Applied Physiology, Nutrition, and Metabolism, Nutrition — An international journal of applied and basic nutritional science, Journal of Nutrition Research. The social science is the integration of mainly five subjects like history (which gives information about our past), political science (gives information about politics), geography (gives information and idea about the geography around us), economics (gives idea about the financial status), disaster (gives idea about the natural calamities which can cause in the world). Chemical engineering is one field that offers many opportunities to apply science to real-world challenges and particularly adaptable to solve the technological problems of modern society. Essentially, chemical engineers design large-scale processes that convert chemicals, raw materials, living cells, microorganisms and energy into useful forms and products. Chemical engineers are in great demand because of the large number of industries that depend on the synthesis and processing of chemicals and materials. Journal of Chemical Engineering & Process Technology, Chemical Engineering Journal, International Journal of Applied Science - Research and Review, Journal of Advanced Chemical Engineering, Journal of Chemical & Engineering Data, International Journal of Chemical Engineering, International Journal of Chemical Engineering and Applications, Korean Journal of Chemical Engineering, American Journal of Chemical Engineering, Chemical Engineering Research and Design, South African Journal of Chemical Engineering.